I wonder if, before I get into talking about habits, should I tell you my theory of mind. Why not. It's nothing earth-shattering, it's basically Freud's id/ego/superego in my own words. I think I've told this to you in pieces already. Body - This is your gut level, I happen to believe that we have little brains all around our body. Cf., muscle memory. You don't have to believe that, but I do. Undermind - This corresponds to Freud's id. This is your subconscious or maybe your heart, you know, your feelings. I have a whole theory of feelings, some other time. Mind - This corresponds to Freud's ego. This is the part of me that's me, my conscious mind. This is the operator, the one who listens to the others and decides the next course of action. 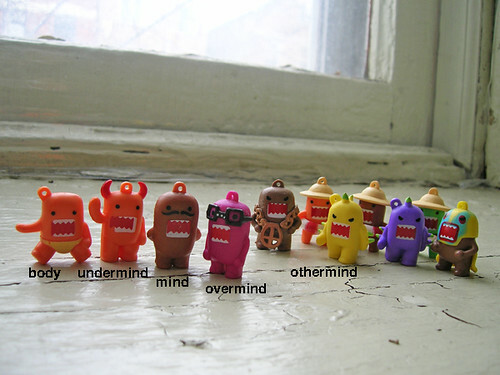 Overmind - This corresponds to Freud's superego. This is your superconscious, which is sort of meaningless. It's your autopilot. The word I use most often for this is scripts, algorithms that you write to automate processes. Othermind - These are the minds of others who are not you, you know, other people that you know. Or you know, Wikipedia when you want to look something up. Or "the media" and whatever it's telling you at the moment. The whole point is to get all of the above, each trusted for its own strengths and entrusted with its own jobs, working smoothly together and functional. I'm not going to talk about all that now. I want to get to talking about habits, which are scripts, which means overmind. Overmind can get hella dysfunctional, that's called bad habits. Overmind is where you put things that you do without thinking; you can see how that can be great and how that can be a problem, right? Also every part of you except mind only thinks this is how it is. So when you're in the grip of a bad habit, overmind just thinks that this is how it is—at four o'clock, I get up and get a package of Twinkies from the vending machine in the breakroom. That is not a hypothetical, that was me Monday through Friday from 1989 to 1992. Mind's job is not to be fooled into thinking that seems is is, first of all, and then it's to imagine the possibilities for is, and then choose and create is. The point is, you want to save mind for important executive and creative functions. In fact—or in this half-baked theory, anyway—it's mind that creates habits. Then they run in overmind, getting things done without having to pay mind to them. Which saves mind, right? So basically anything that I need or want to get done, that I've done my thinking about, gets made into a habit. So things get done, and boy, you can get a lot done like this, it is faster after all to do things without thinking, which of course is why you should slow down and think sometimes. Not everything gets made into a habit, lots of things I'm not done thinking about and keeping in mind, all the more reason to make room.